saturday excursions - snts2019s Webseite! About 60 kilometers south-east of Marburg the idyllic region Wetterau is home to the Celtic World Glauberg. 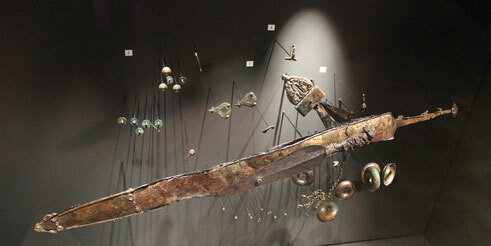 A finding of a monumental statue of a Celtic ruler (“Keltenfürst”) and the finds from three Celtic burials (5th century BCE) led to intense research on the Celts in Hesse and the European network of Celtic cultures. 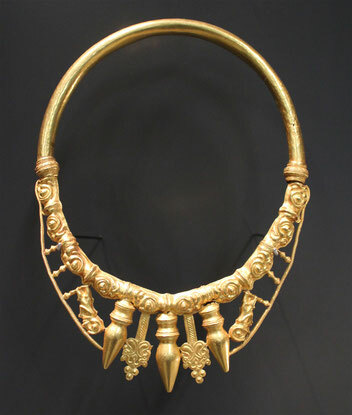 Today, these finds are recognised throughout the world as an archaeological sensation and as unique. The archaeological site located close to the city Glauburg has seen several widespread excavations during which these breath-taking discoveries concerning the Celtic heritage have been made. The research, however, is far from finished and it is believed by the leading archaeologist of the site Director Dr. Vera Rupp that this place still holds many secrets waiting to be discovered by the active research community around the Celtic World Glauberg. Leaving Marburg at 9.00 am, the first part of our excursion will take us to the recently built museum at the site, which has been awarded for its exemplary architecture and offers a magnificent view of the area, including the skyscrapers of Frankfurt and the Taunus mountains mentioned by Tacitus. At Celtic World Glauberg, we will have guided tours of about 60 minutes around the exhibition and the viewing platform on the top of the museum. The tours will be offered in English and German. Afterward, we will be free to explore the site by ourselves and have a three-course summer buffet (included) with products from the region in the restaurant associated with the Museum. We hope that a Hesse “Kippbembel” will be available. At around 1.15 pm we will be leaving for the second destination of our excursion. After a bus ride, we will arrive at the worldwide unique Roman fort Saalburg reconstructed under the scholarly guidance of such outstanding scholars as Theodor Mommsen (1817–1903). Again Tacitus mentions a “castellum in monte Tauno”. The Saalburg is a reconstruction of a Roman fort which was part of the Upper Germanic-Rhaetian Limes (UNESCO world heritage in 2005). 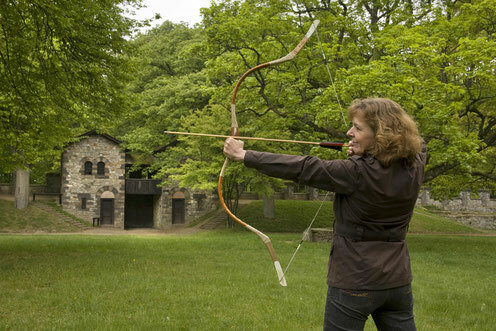 Since the start of its restoration in the early 20th century and to the present day, the fort has been one of the leading research centres of experimental archaeology worldwide, spanning from recreating ancient workshops to re-enacting daily life at a Roman fort. The director of Saalburg museum Dr. Carsten Amrhein gave us an example for one of the more pleasing outcomes: the Roman leather working reconstructed by the Saalburg research centre influenced the “Gladiator Sandal” by Prada. 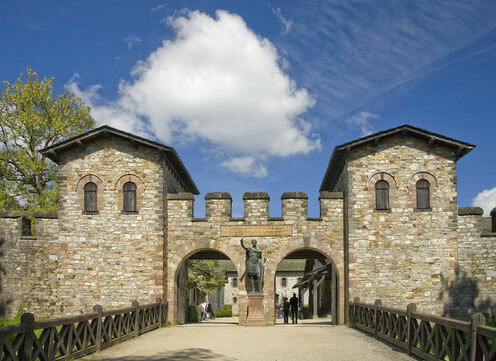 The Saalburg is host to exhibitions of archaeological findings from the Roman era and also of operational replicas of ancient weaponry rebuilt for the experimental use by Prussian soldiers in the 19th century. One of the more recent sensational findings is the head of a life-sized gold-plated bronze equestrian statue dating back to 4 BCE to 16 CE that has been discovered in 2009. There will be guided tours in English as well as in German introducing us to the important exhibits and the impressive locality. Between 3.15 pm and 5 pm, we will have the opportunity to have a walk around the area or perhaps to enjoy a Roman specialty at the Taberna (e.g. Lucanian sausage or moretum), the museum's associated restaurant (not included). At 5.00 pm, we will be heading back to Marburg where we will arrive at about 6 pm. The view over the rocks of the Lorelei is one of the most famous landscape motifs in the whole of Germany and worth a trip for many people from all over the world. 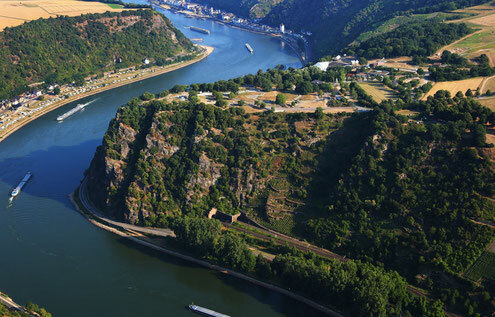 It is situated in the Middle Rhine Valley with its castles, historic towns and vineyards, and graphically illustrates the long history of human involvement with a dramatic and varied natural landscape. We will start in Marburg at the Erwin-Piscator-House at 8.30 am. 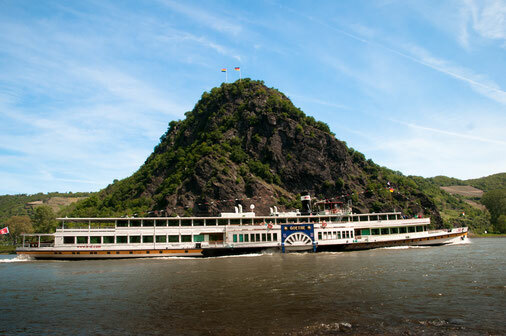 In the morning we will travel through the beautiful river Lahn valley to Limburg, Katzenelnbogen and Nastätten to the Lorelei, a 132 m (433 ft) high, steep slate rock on the bank of the river Rhine. The old German name Lorelei, "murmur rock," was given to the spot because heavy currents, a waterfall and a special echo produce a murmuring sound by the rock. There is no wonder that many tales about a singing mermaid who lured poor boatpeople by her singing inspired famous poets like Clemens Brentano and Heinrich Heine to compose their ballads and poems in the 19th century. A 90min guided tour on the top of the Lorelei-Plateau will bring to life the myth as well as the history of this famous landscape with considerable historical importance. After a lunch in the medieval town St. Goarshausen at the riverside we will take a boat to cruise on the river Rhine to Lorch (90min). We will have a fascinating view from the waterside of the canyon-shaped river valley with its castles, fortresses and vineyards. The bus takes us from Lorch back home to Marburg arriving at about 7.00 pm. Minimum number of participants: 30 persons.